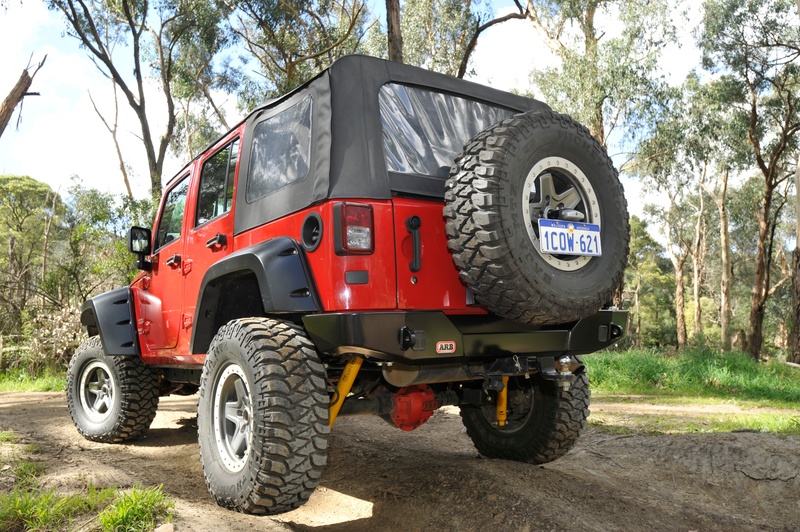 Designed to offer simple and light weight protection, the Jeep JK ARB rear bumper can be fitted with an optional wheel carrier assembly allowing the fitment of a spare tire up to 37 inches (modifications to the 3rd brake light may be required to fit a 37” spare tire). Incorporating two 20mm recovery eyelets designed to receive a 4.75t D-shackle and two Hi-Lift jacking points, the rear bumper can be fitted as a protection device on its own, allowing the original spare to remain mounted to the rear door. Alternatively, the rear bumper can be optioned with the new “catchless” design wheel carrier. The wheel carrier opens automatically when the vehicle tailgate is opened and has adjustment for up to 1 inch body lift kits. Manufactured from 3mm laser cut and folded steel sheet, the upswept wings give superior departure angle while also protecting the rear quarter panels from damage. The center pan section is recessed to allow for fitment of larger than standard tyres to the wheel carrier. The rear bumper does not incorporate a tow hitch but is designed to integrate with a factory fitted or aftermarket receiver hitch that mounts to the center of the chassis rear cross member. Recovery points manufactured from flame cut 20mm steel plate pass through the rear bumper and are welded to the mounting bracket uprights for extra reinforcement. The rear bumper recovery points include an elongated slot so that the shackle bow can be passed through the point, allowing the shackle to pivot when pulling from slight angles. Pre laser cut holes are provided in the rear bumper for fitment of the wheel carrier. If no carrier is to be fitted, the knock out sections are simply left in place. Designed primarily for Hi-Lift brand jacks, the Hi-Lift jacking point is reinforced with 4mm steel plate to prevent distortion or damage. When the jack leg is inserted into the point, the lip of the jack foot locates past the internal reinforcing plate to prevent slippage. When not in use, jacking points are fitted with a rubber plug. Machined plastic bushes are used as bearings in the hub. These should require no future adjustment or servicing. The bearing cap is a push-in interference fit.